On the hunt for soft lips, I think guys and girls alike make the fatal mistake of buying overpriced products, thinking that’s the only way to do the job, and completely overlook the little things that could save them a ton of money. Little things like homemade sugar lip scrubs, Vaseline, and Chapstick. One dollar Chapstick can make my lips soft by Valentines day? You’re asking. It works for me! Slather on the Chapstick before bed, and you’ll wake up with baby soft lips. Reapply throughout the day. Try this. If it doesn’t work, all you’ve wasted is a dollar. Walmart is selling four different special Chapsticks besides the regular Cherry, Vanilla, etc flavors. My eyes lit up at the sight of these cheap beauties. I couldn’t choose one so I bought all four, claiming it was for a blog post and not because I have pathetic decision making skills. Candy Cane: This one along with Pumpkin Pie may be left over from their seasonal stash, but I was at Walmart just a few days ago and they still had plenty of both these flavors. (PS. Do you say flavor or scent? 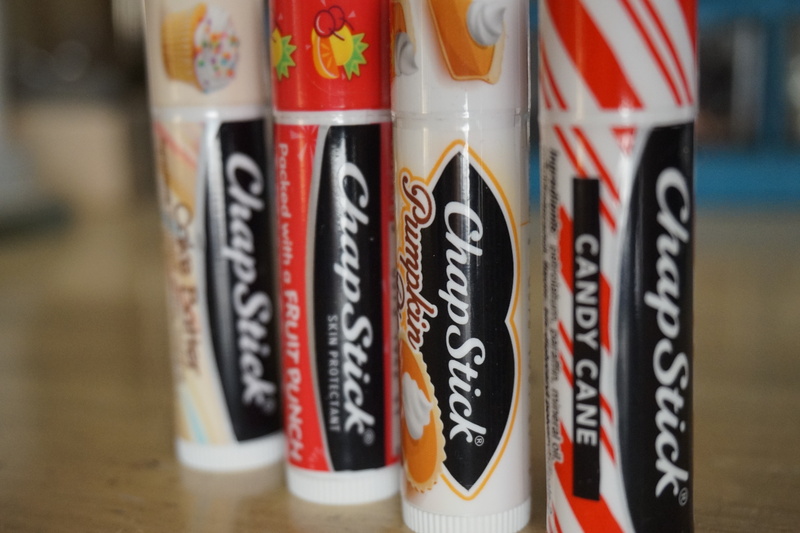 Flavor makes no sense to me, but I hear no one describing the types of Chapstick as scents.) I figured Candy Cane would simply smell like peppermint, but it does smell like a candy cane candy! It has that sweetness added. This flavor does depress me a little because Chris seems to only use a strong peppermint Chapstick so every time I apply it, I think of him and get all sad. There’s no tint to this Chapstick. Pumpkin Pie: I can’t really agree that Pumpkin Pie smells like pumpkin pie. (I’m a pumpkin pie aficionado.) It has some spice to it, but honestly smells like a typical holiday candle, or like that tiny layer of pumpkin pie where the pie filling and the crust meet, so it’s basically moist crust that has an after thought of left over pumpkin pie taste, but doesn’t really taste like pumpkin pie or crust. Man, do I give the best descriptions ever. It has a brown-orange tint to it. Fruit Punch: With Fruit Punch, I was a little annoyed with the childish packaging. They were doing so well! But this one smells really good. Total fruity delicious candy smell. It drives me crazy that I can’t pinpoint this to an exact candy. It smells like a red fruit candy, if that makes sense. I jump around between Pixy Stix, Jolly Ranchers, or red Starburst. Red Starburst seems the most accurate. This one does have a red tint to it, which is why I’ve always liked the red colored Chapsticks, but if you’re a guy, you may want to take this into consideration. Cake Batter: This one doesn’t smell so much of Cake Batter as it does of Vanilla Icing. Vanilla Icing freshly spread on a sugar cookie, a thick layer you can sink your teeth into, topped with sprinkles. And oh. It smells good. Not a sickly sweet smell, either. I use Fruit Punch the most for the tint, but Cake Batter wins in the smell department. I hope you enjoyed this budget-friendly review! You’ll be on your way to soft lips in no time, or else your face will just smell really good. My all time favourite lip balm has to be from Burt’s Bees in Acai Berry flavour. I’ve never tried Vaseline or Chap Stick brand before but have read great reviews on both. You should give them ago! They’re WAY cheaper than Burts Bees, at least where I live. These sound DELICIOUS. hehe. Especially cake batter, that’s probably the flavour I would go for if a) I had Walmart on my continent, and b) I even ever remembered to apply chapstick. heh. I have a terrible memory. Also: PUMPKIN PIE!! 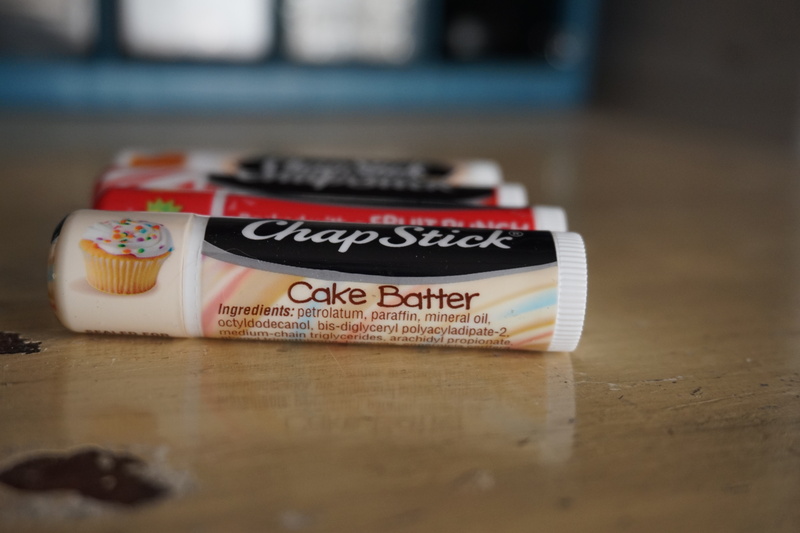 Lol if I ever go to Australia, I shall bring good ridings of Chapstick in Pumpkin Pie and Cake Batter flavors! I usually just use whatever I find at the bottom of my backpack, but I might just have to pop over to Walgreens before class to get one of these. All I have at the moment is a tropical-scented Blistex. Ew Blistex is a give and take kind of brand in the flavors. But I hope you’re able to find that prefect Chapstick at Walgreens! Thank you for your comment!